GitHub - addy-dclxvi/i3-starterpack: A simple guide (and example of configuration) to install i3 & its and essentials packages, then make them look eye candy. A simple guide (and example of configuration) to install i3 & its and essentials packages, then make them look eye candy. Want to be notified of new releases in addy-dclxvi/i3-starterpack? Example configuration in this repo is pretty simple, minimal, and easy to be understood, without reducing the usability. Only contains about 140 lines of i3 configuration, pretty stock without any custom script, custom packages, and custom patch. 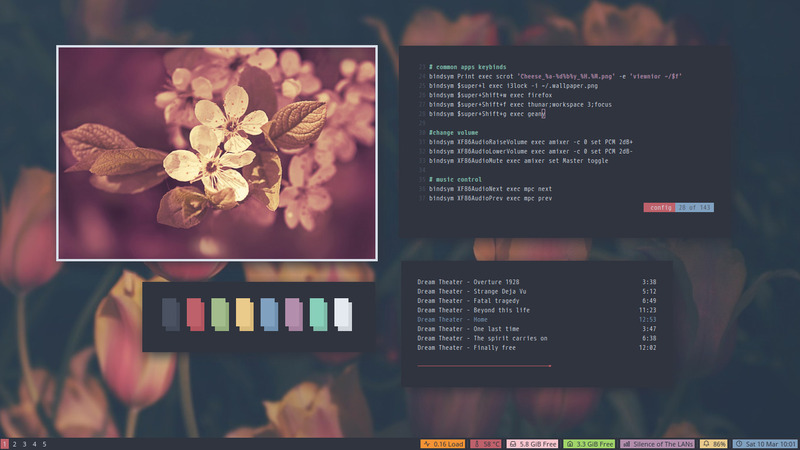 This is my daily i3 configuration by the way. And this configuration only use packages that available on most Distros main repository. So You don't need AUR, PPA, xbps-src, or sudo make install. I'm using Debian, with i3 stock metapackages (i3wm, i3bar, i3status, i3lock, i3-sensible-terminal, and i3-dmenu-desktop), so does this guide. Hence I name this repo i3-starterpack. So, the installation guide here will use Debian command & package name. Clean, without any opened app. Only i3bar is visible. Rofi, my favourite dmenu alternative for launching apps. 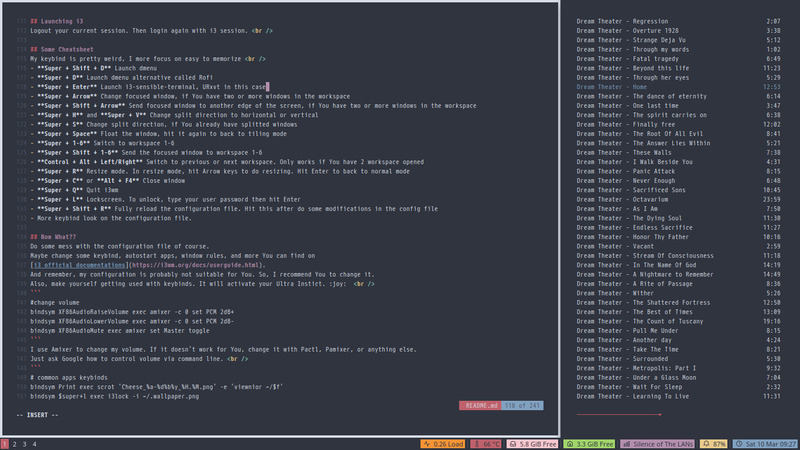 Fullscreen, when I write this guide using Vim inside URxvt. Vanilla i3, so has no gaps. Splitscreen, I open ncmpcpp music player on the right. 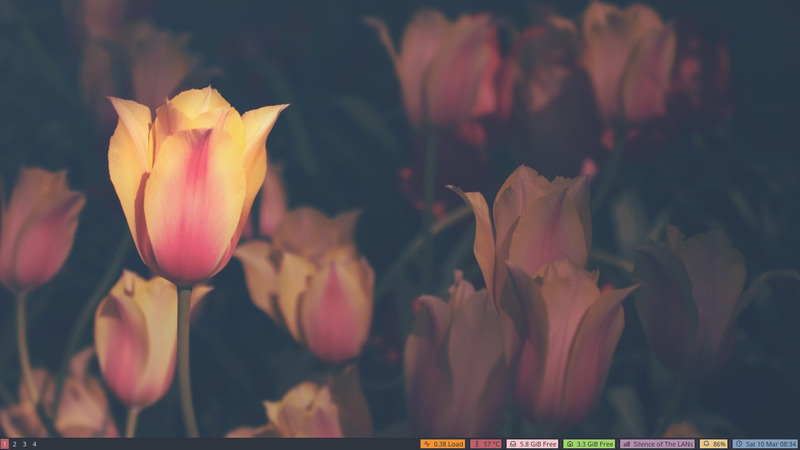 I've got frequently questioned, "How to make my desktop looks like yours?". I don't know why they ask it to me, my desktop doesn't even look nice. So, I only answer "What DE do You use? 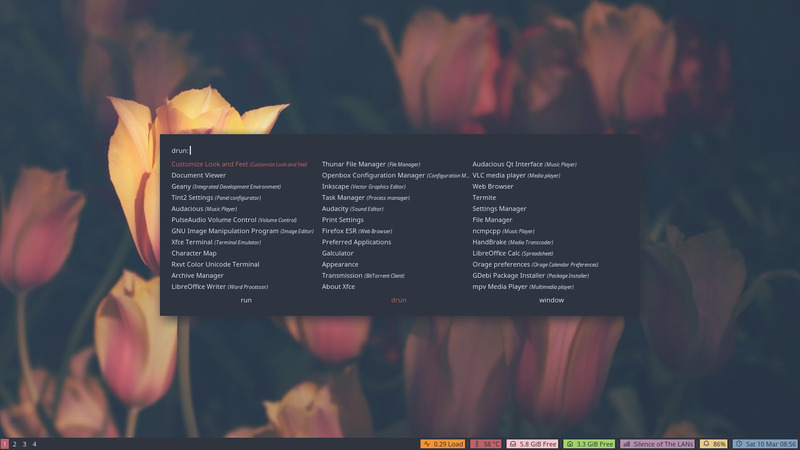 Have You tried window manager? You can use Google to find some guide". "I have been following the guide I found, but my desktop still doesn't like yours". "I don't know what is my DE. It's default on my Parrot Security." "DE? What is DE? Btw, I use Kali Linux. Have You watched Mr.Robot?" At least a working Desktop Environtment or Window Manager (I'm sure You already have it). Why? Just to make sure already have some essential packages like Xorg, Display Manager, Sound Mixer, Network Manager, etc. My recommendation is start from Xfce. It's quite minimal for a Desktop Environtment. And We can use some of its useful components later. Like file manager, text editor, power manager, clipman, task manager, or maybe its settings daemon. Willing to learn, patience, and ability to use Google for fixing problems. Some great musics for companion. I recommend You to listen Scenes from a Memory album by Dream Theater. It will give You i3-wm, dunst, i3lock, i3status, and suckless-tools. If i3-wm, dunst, i3lock, i3status, and suckless-tools are not installed automatically, just install them manually. Compton is a compositor to provide some desktop effects like shadow, transparency, fade, and transiton. Hsetroot is a wallpaper handler. i3 has no wallpaper handler by default. 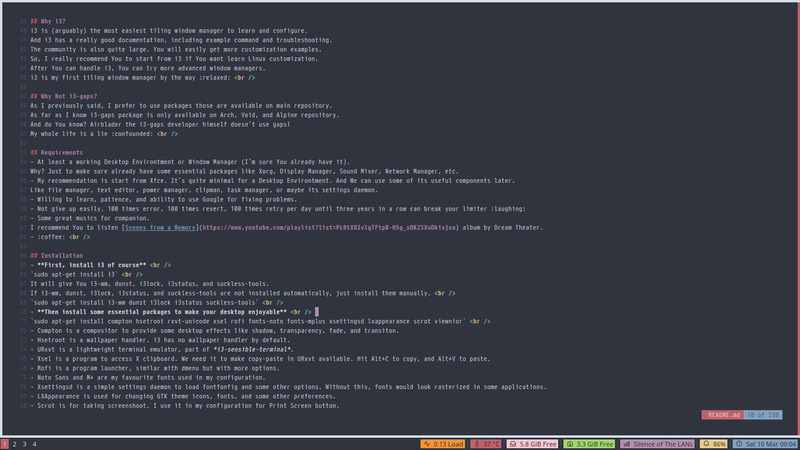 URxvt is a lightweight terminal emulator, part of i3-sensible-terminal. Xsel is a program to access X clipboard. We need it to make copy-paste in URxvt available. Hit Alt+C to copy, and Alt+V to paste. Rofi is a program launcher, similar with dmenu but with more options. Noto Sans and M+ are my favourite fonts used in my configuration. Xsettingsd is a simple settings daemon to load fontconfig and some other options. Without this, fonts would look rasterized in some applications. LXAppearance is used for changing GTK theme icons, fonts, and some other preferences. Scrot is for taking screenshoot. I use it in my configuration for Print Screen button. I set my Print Screen button to take screenshoot using scrot, then automatically open it using Viewnior image viewer. Or if You don't have git package installed, and have no willing to install it. Just use download as zip button on the top-right of this page, then extract it. After that, Open i3-starterpack folder. Then copy the configurations to your home. I mean if it's on i3-starterpack/.config/i3/config, copy it to ~/.config/i3/. If the folder doesn't exist on your home, just make it. Do the same with all of the files inside i3-starterpack folder. My dotfiles contains font, so refresh your fontconfig cache fc-cache -fv after You copy the font. Note : You can deploy this repository recursively using git clone https://github.com/addy-dclxvi/i3-starterpack.git && cp -a i3-starterpack/. ~ but I recommend You to copy the configuration files one by one to make yourself have more control. This is the main configuration file of i3 window manager. Contains keybinding, autostart, colors, and window rules. I suggest You to leave it default for now. I will explain it later. This is the statusline configuration for i3bar, bottom right part of i3bar. I set it to load many module by default. It looks like christmast tree. So, I suggest You to disable some module You don't need. You can comment out the module You want to disable. For example I disable the disk, ethernet, and battery. Then now You have to configure the variable. Don't forget to change both in order list and in function list. Update 31 July 2018 : And remember, i3status supports Pango Markup. Not many customization options, but still interesting. Here is my current i3status customization (I remove the lines I don't use instead comment them out). format = "<span background='#ff5555'>  </span><span background='#e5e9f0'> %degrees °C </span>"
format = "<span background='#50fa7b'>  </span><span background='#e5e9f0'> %5min Load </span>"
format = "<span background='#f1fa8c'>  </span><span background='#e5e9f0'> %free Free </span>"
format_up = "<span background='#bd93f9'>  </span><span background='#e5e9f0'> %essid </span>"
format_down = "<span background='#bd93f9'>  </span><span background='#e5e9f0'> Disconnected </span>"
format = "<span background='#ff79c6'>  </span><span background='#e5e9f0'> %volume </span>"
format_muted = "<span background='#ff79c6'>  </span><span background='#e5e9f0'> Muted </span>"
format = "<span background='#8be9fd'>  </span><span background='#e5e9f0'> %time </span>"
format_time = "%a %-d %b %H:%M"
My wireless interface is wlp2s0 and my ethernet adapter is enp1s0, You can find yours by /sbin/iwconfig or iwconfig command. My battery id is BAT1, You can find yours by ls /sys/class/power_supply/ command. My volume mixer is Alsa, probably also work for You. If not, You can see the manual page to configure PulseAudio. You can add more module, just read the manual page man i3status. Logout your current session. Then login again with i3 session. More keybind look on the configuration file. I use Amixer to change my volume. If it doesn't work for You, change it with Pactl, Pamixer, or anything else. Just ask Google how to control volume via command line. I use Mpd for music daemon, control it using Mpc, and use ncmpcpp music player as frontend. If You are not using it, I recommend You to remove it. Because it has a chance to intercept your music player global keybind hotkeys. Or maybe You can try playerctl. It's the common way to control media, and supported by a lot of popular media player. Maybe You want to add some programs to your autostart, like network manager applet, clipboard manager, power manager, conky, and some goodies. Probably your network manager applet is nm-applet. So, if want to use it, add exec --no-startup-id nm-applet. It will be loaded on next login. I don't put it on my autostart, because usually I only launch it from terminal when I want to switch SSID. And if You come from Xfce maybe You want use its setting daemon. Replace exec --no-startup-id xsettingsd & with exec --no-startup-id xfsettingsd &. You will have some Xfce advantage, like mouse settings, appearance settings (LXAppearance will be overiden by this), font settings, and some other advantage. But it will cost a thing, slightly reduce the performance. That's my window rules. I use it to group apps on several workspace. And I set some apps to launch in floating mode. You can make your own rules of course. Maybe my window rules isn't efficient for You. My workspaces are only six, and it's more than enough for me. That's my panel colour. I set it has a black background, with white color for workspace name. Active workspace is highlighted by red colour, and urgent workspace will be highlighted with yellow colour. If one of your workspaces is highlighted with yellow colour, it means that workspace needs an attention. You can modify it by yourself of course. I think, this is quite enough for a starter. You can improve it by yourself.